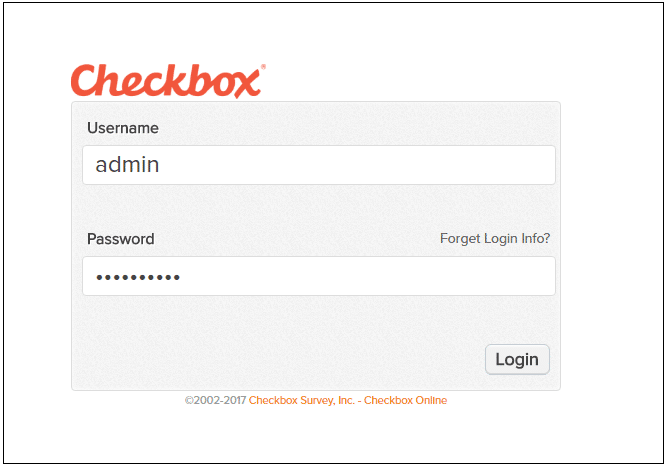 Log into Checkbox by entering first your Username and Password on your custom sub-domain login page. After entering the correct login credentials, select Login to open your Checkbox account. CHECKBOX TIP: Your domain and username were emailed to you when you set up your account. If you don’t know your domain or username, please email support@checkbox.com. If you forgot your password, select the “Forgot Login” link for assistance. 1. 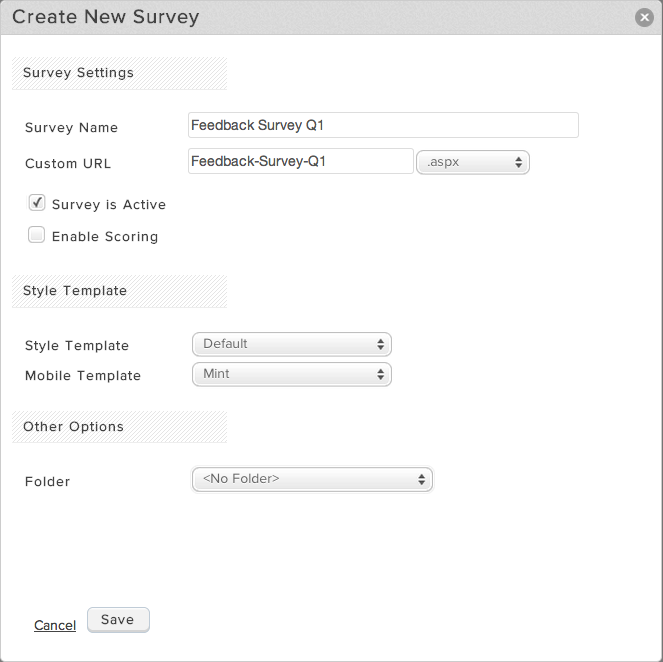 To begin the survey creation process, select Surveys from the main application menu. This will bring you to the Survey Manager. 2. Once in the Survey Manager, select the + Survey button to add a new survey. On this window, you also have the ability to enable scoring, apply style templates, and move the survey into an existing folder. In the example below, we have left all settings to their defaults. These settings can be configured later from within the Survey Editor. Save your survey settings to enter the Survey Editor. 4. Your new survey has been created with a single blank page. Use the +Page button to create more pages. Use the arrows on the left side of the page bar to expand a page and view items on that page or add Branching or Conditions at the page level. 5. To add a survey question or item to Page 1, select + Item next to the Page 1 label. 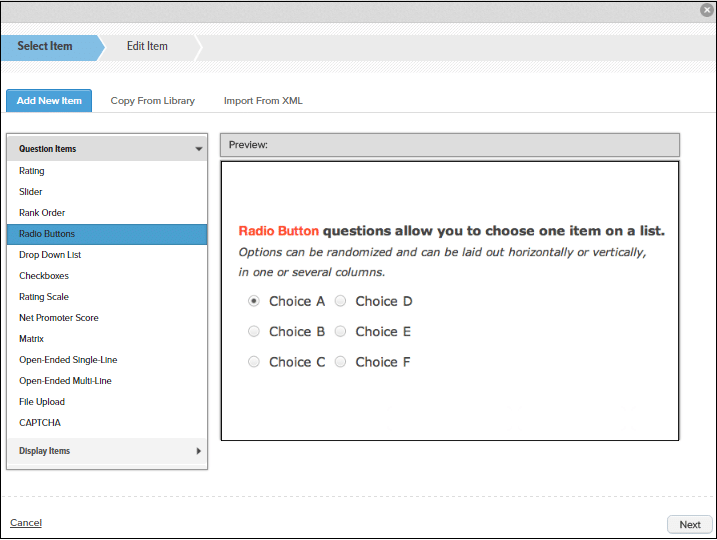 In the example below we selected the Radio Button item type from the Question Items category, so we see a preview of that item. 7. 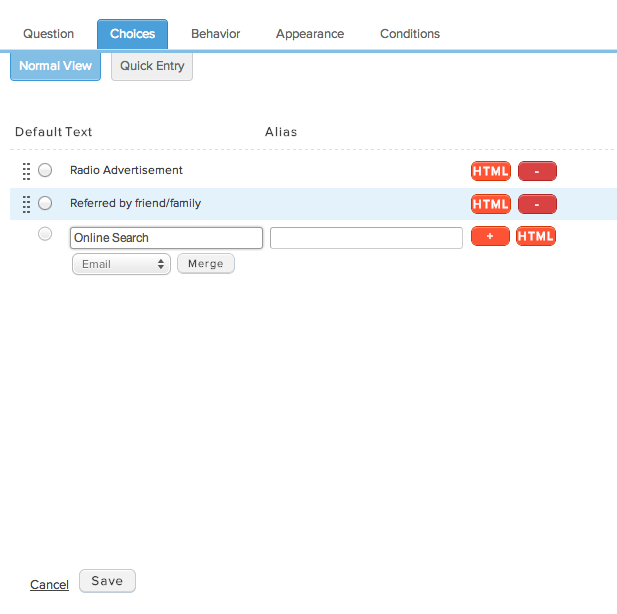 Configure your question using the editor tabs. 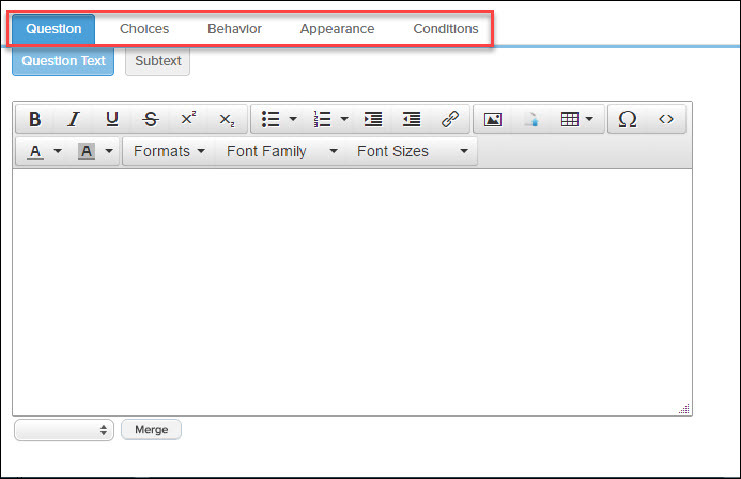 Go to each tab in the editor and configure as desired. NOTE: Item editor options vary depending on item type. 8. Enter your question text in the field provided on the Question Text tab. HTML code can be altered by clicking the <> button. NOTE: If you are cutting and pasting text from another application, be sure to paste the text into the <> code view. Pasting into the HTML view may pick up formatting from the external document that is not compatible with Checkbox. Pasting into the code view will paste it as plain text. You may then toggle back to the normal view to apply formatting using the editor toolbar. 9. Move to the Choices tab and add the possible answer options for the question you just entered. After entering an answer choice into the text field provided, select the orange “+” icon to save it. A new answer choice field will appear. You can also type or copy and paste your answer options on the ‘Quick Entry’ tab. In the example below, we only configured Question Text and Choices. All other item properties were left to their defaults. Save your item to return to the survey. 10. 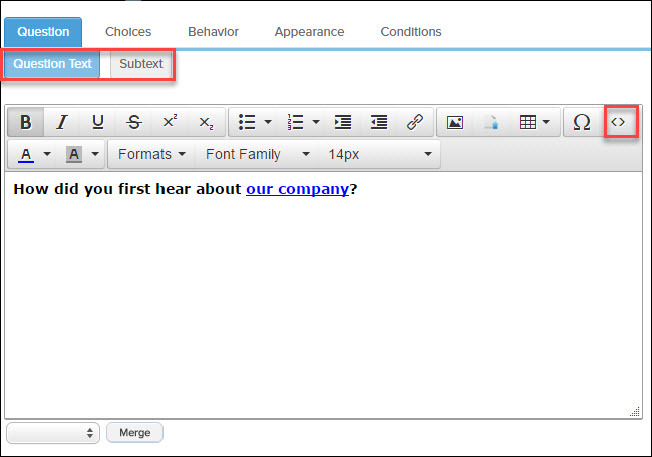 If you need to change an existing question item, select it from the survey navigation pane to expand its Item Editor. This editor is the same as the initial editor you used to create the item. Go to each tab and update as necessary. NOTE: Checkbox will automatically save your changes as you move from tab to tab. You do not need to select Save until all item configurations are complete. Do not navigate away from the item before saving your changes. Thanks for viewing our Quick Start Guide: Creating a Simple Survey. Return to the Documentation page for more detailed guides on each area of Checkbox.